The HF-60105 V4 (HF60105) is a high-frequency RF spectrum analyzer that provides simplified measurement of RF signals for Interference and exposure applications. Find radiation sources in your surroundings. Find their respective frequencies and signal strengths, including direct display of exposure limits. The highly complex calculations required for exposure limit calculations are performed automatically by a high-performance DSP (digital signal processor). Exposure levels for various standards are displayed as a practical bar graph display (including convergence display in percent) while the measurement is running. 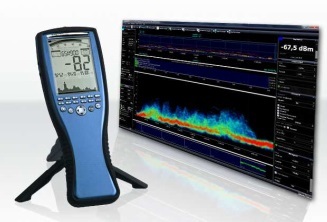 See the must watch video of Spectran Analyzers and Antennas. Aaronia is the cutting edge. See the video of the Araonia booth and prepared to be wowed.